End of Lease Cleaning is one of the top cleanup companies in Melbourne. It provides exceptional facilities at cheap adjustable rates to domestic as well as commercial clients. The comprehensive services provided by us includes versatile grounds such as houses, flats, offices, end of lease cleaning, carpets and upholstery. The company focuses mainly and almost purely on the domestic cleaning because of its sense of social responsibility and the increasing demand from the client for the quality service. Nowadays there are many easy and straightforward ways to tackle all critical situations. People keenly hire professionals to resolve these situations, so that you may save your precious time and hard earned money. To save money many people used to try all these work by them but they don’t clean it well as the professional cleaners and them unable to clean it in the proper manner. Mostly our professionals perform them cleanup process in according to the landlord requirement. The only professional cleaner may applicable to clean with the help of various tools and techniques. 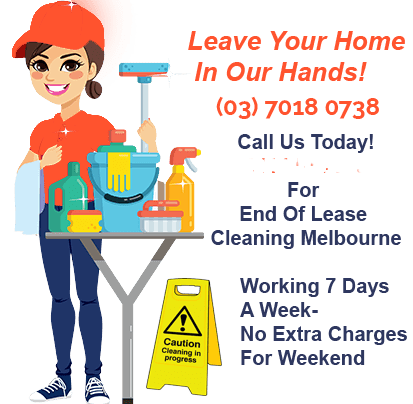 On the alternative, End of Lease Cleaning Melbourne covers an extensive range of cleansing tasks in their packages, variable on the location and size of the property.The company offers a range of versatile frequency in the jobs. You’ll decide that service you plan to use.With those professional cleaners, you may get your cleanup done on time with lowest charges and the guarantee for bond come back also. nd of Lease Cleaning is the process that uses before moving out of the house or the office after the lease. This process is done to show how thoughtful the people are about the house, landlord and ease the work of the future tenant apart from fulfilling contract obligations and get back the security bond. By choosing us, people get back their deposit as the rooms are better than before and well managed by us. That is why people hire us to resolve their situation and wisely avoid any landlord-tenant disputes. Through this, they save their time and by choosing us they save their money rather than doing on their own or other companies.